Our .NET barcode maker & generator library can be used to make and generate QR Code, EAN-13, UPC-A, Code 128, Code 39, and more barcodes for your .NET Windows Forms applications development. 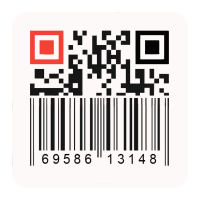 You can draw and generate linear & 2d barcodes by simply dragging & dropping .NET barcode generator WinForms control or just use .NET class code to make and create barcodes. It’s quite easy to integrate CnetSDK .NET Barcode Maker & Generator SDK to your .NET windows project. By adding .NET WinForms barcode generator control to Visual Studio toolbox or WinForms project reference, you can use all advanced barcode creation and generation features for your .NET application development. All linear & 2d barcodes properties are customizable. Please Note: a watermark ("www.cnetsdk.com") will be shown on each generated barcode image randomly if you are using .NET barcode creator trial. CnetSDK .NET Barcode Maker & Generator SDK can be used as a .NET WinForms control. By dragging and dropping barcode generator control to your .NET Windows Forms, you can easily make and generate linear and 2d barcodes. Please Note: one instance of .NET Barcode Generator Control for WinForms can only encode and draw one barcode image. And this .NET barcode generator control appears on windows form uses default settings for barcode creation. You can adjust .NET WinForms barcode generation settings to draw and make desired barcode image. * In "Choose Toolbox Items" form, click the button "Browse...", and choose "CnetSDK.Barcode.Generator.Trial.dll". 3. In your .NET WinForms application, open a Form in design mode. Then, drag & drop .NET barcode maker component ("CSWinControl") item from toolbox onto windows form. 4. A sample barcode image will show on the windows form. Besides making and generating barcodes with .NET WinForms barcode generator control, you can also use CnetSDK .NET Barcode Generator Library to draw, make and generate barcode images in .NET WinForms class. See details as below. 1. Unzip CnetSDK .NET Barcode Generator SDK zip package and you will find "CnetSDK.Barcode.Generator.Trial.dll" under Lib folder. 2. Then, add .NET WinForms project reference to "CnetSDK.Barcode.Generator.Trial.dll". There's no need to copy this barcode maker library to the bin folder. It will be added automatically. 3. Generate a sample QR Code barcode using the following barcode generation C# sample code in your .NET WinForms class. For ASP.NET web barcode generation, please see: How to Draw & Generate Barcode on ASP.NET Web Page. The following 1d and 2d barcodes can be encoded and generated by CnetSDK .NET Barcode Maker & Generator SDK. All barcodes creation features can be used in .NET Windows Forms application. You may see more specific barcode types generation in .NET applications.